Yesterday I commented on a variety of the top baseball things of the 200’s. Today I give you my all-decade team. These are my choices for best of the decade. One proviso, no one tainted by the steroids scandal can make the team, so no Bonds, no Sosa, no Palmeiro, no Clemens, no Rodriguez. I’m making no judgement on guilt or innocence, but exclude the player until such time as we can determine if his numbers are bogus. If they aren’t, I’ll be glad to change the list, but until then, here they are. The outfielders are designated A, B, and C. The order is alphabetical and nothing else should be construed from the order. 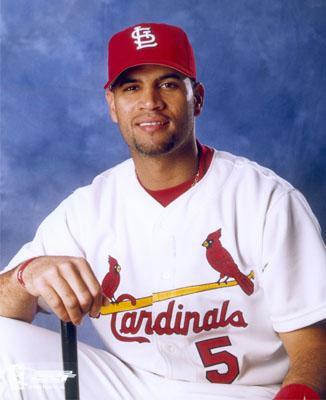 1b-Albert Pujols. This may have been the easiest choice of all. Maybe the greatest First Baseman I’ve ever seen and I can go back to Gil Hodges and company. It’s been a great era for First Basemen and Pujols is clearly the best. 2b-Chase Utley. It’s not been a great era for Second Basemen, but Utley is the best of the lot. He’s a good fielder and a first rate hitter with some speed and power. He does have a tendency to tail off a bit at the end of a season and gets hurt a lot. ss-Derek Jeter. Yankees captain and sparkplug. Not as good as some people seem to think (he is not the second coming of Honus Wagner) but still one heck of a shortstop. Seems to be on the downside of his career, but still putting up excellent offensive numbers. He may be next to 3000 hits. 3b-Chipper Jones. The Braves seem to want to move him to the outfield but always end up putting him back at third. Good bat, but now in the decline phase of his career. Outfield A-Torii Hunter. Superb centerfielder. Also a good hitter. Seems to be a positive influence in the clubhouse. Outfield B-Manny Ramirez. I get a little tired of his act and I cringe when the ball is hit his way, but wow can he hit the ball. World Series MVP and major contributor to breaking an 80 years plus championship drought in Boston. Outfield C-Ichiro Suzuki. An absolute hitting machine. Most hits in one season, speedy, good fielder, helped make Japanese players more acceptable to US audiences. Between US and Japan he may end up with 4000 hits. Catcher-Joe Mauer. May become the greatest hitting catcher ever. Certainly already among the best. Also a fine defensive backstop. Has 3 batting titles (no catcher has more and only 1 has as many as 2) and an MVP. DH-David Ortiz. Dominent DH for much of the decade. Lots of power, little speed, not much of a fielder, but crucial to Boston winning in 2004 (when he was league championship MVP) and in 2007. Seems to be deeply on the downside of his career. Pitcher-Randy Johnson. I saw Spahn, Koufax and Carlton so it’s tough to call him the greatest left hander I ever saw, but he is very, very good. Three Cy Young Awards in the decade, one World Series win and the MVP to go with it, and lots and lots of wins and strikeouts. He’s through now and I hope he hangs it up (I’ll get to see him in Cooperstown quicker). Closer-Mariano Rivera. The best postseason closer ever, although he botched game 7 of the 2001 World Series and 2 chances to close out the 2004 AL championship. Still he’s just better than anyone else, and he’s not bad in the regular season either. There they are, team. So who’d I forget?